Perhaps we&apos;ve reached fake food news fatigue, what with the widespread coverage of Aporkalypse Not. Despite the Wall Street Journal&apos;s frightening front page story, the paper failed to incite a Starbucks Pumpkin Spice Latte panic. Remain calm: There&apos;s no PSL shortage, and in Chicago we have something even better. Behold the Jo Snow 2012 fall collection, limited edition, seasonal syrup: Pumpkin Coconut. 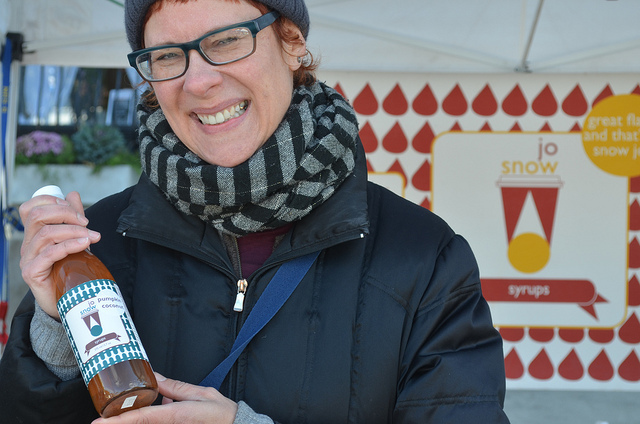 Near the end of the first cold day at this season&apos;s outdoor Logan Square Farmers Market this Sunday, I ran into Jo Snow&apos;s self-described Senior Syrup Slinger, chef/owner Melissa Yen. During our crazy-making hot summer, her booth was always swarmed with desperate market-goers waiting for hand-shaved, sanity-saving snow cones. Wonder what the snow cone lady does when it&apos;s cold? Unlike the ice cream trucks that hibernate for the winter, Yen bundles up to serve hot drinks, including apple cider spiked with fig vanilla black pepper syrup, even to ten-year-old regulars. Jo Snow syrup stars in Ipsento&apos;s Pumpkin Patch Latte, made with actual pumpkin purée, espresso, whole and sweetened condensed milks, cinnamon, nutmeg and the pumpkin coconut syrup. Milk & Honey created a pumpkin coconut hot chocolate with coconut and whole milks, chocolate and pumpkin coconut syrups and a toasted coconut marshmallow float, finished with pumpkin pie spice and whipped cream. Yen finds flavor inspiration through her travels and at home. Her Taiwanese husband got her hooked on bao bing, his home country&apos;s national shave-ice dessert. The market booth serves it in the summer here with sweet red beans and tea jelly. Then, last winter Yen and her husband visted Vietnam. 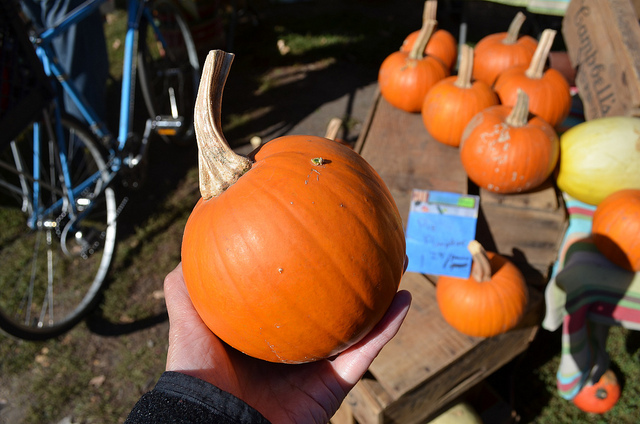 "When I was creating the pumpkin coconut syrup I thought about the creaminess pumpkin and squash impart and what you could pair with it," she said. "It was fall and my thought traveled to soup, so I pulled out the cook books. I saw so many pairings for pumpkin coconut soup; a lot of coconut curry soups. Well, I wasn&apos;t using curry, but the pumpkin pie spices could stand in for the curry spices. They had some of the same qualities. So the pumpkin coconut syrup was influenced by those Southeast Asian pumpkin coconut curry soups!" 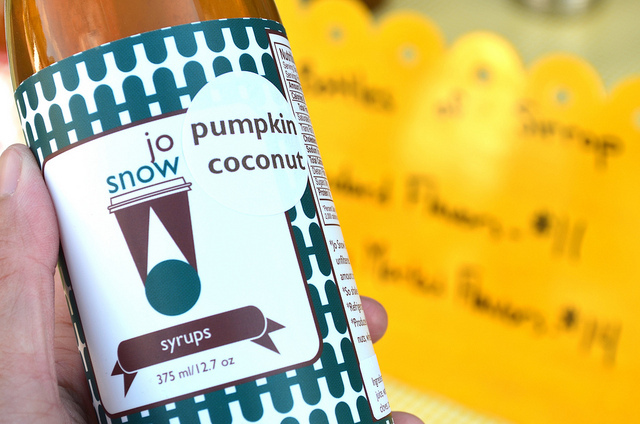 In case you were wondering, the Jo Snow pumpkin coconut syrup is made with organic sugar, nutmeg, cinnamon, cloves and a natural coconut flavor. Starbucks pumpkin "sauce" as they call it: sugar, condensed nonfat milk, sweetened condensed nonfat milk, annatto (E160b, color), natural and artificial flavors, caramel color (E150D), salt and potassium sorbate (E202, a preservative). Like I said, even better.